She is in the process of turning left. 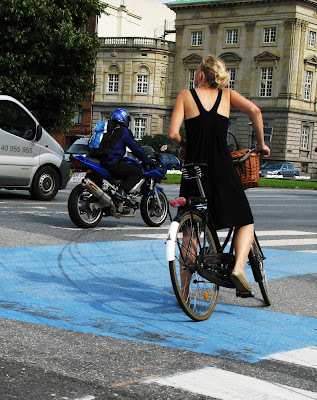 Cyclists are allowed to turn left, but only if they proceed to the far side and wait. If there is no traffic in either direction, they can cross. It is one of the few situations where bikes aren't completely equal with cars. One of the very few. Bikes otherwise enjoy equal status in the traffic. The Copenhagener above is eyeing the red light, waiting for that moment when it turns to yellow, shortly followed by green. Any moment now. Wait for it. And then she's off.